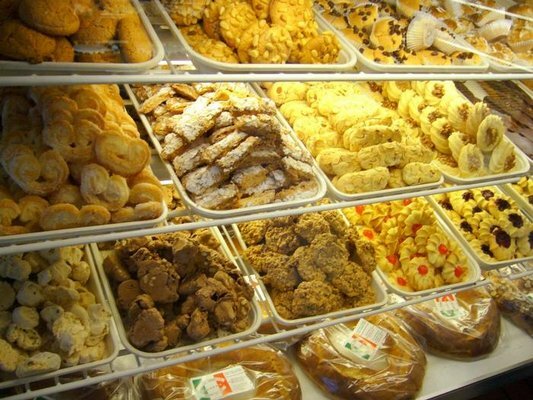 I think Dianda's little Italian cookies are better than Stella bakery. I know, I know it's almost blasphemous. But, after trying a large sampling of cookies (and I mean almost embarrassingly large - when I said it was just for me, the person helping me raised his eyebrows), I must say the flavors and textures of every single one were spot on. The almond cookie with pine nuts, a classic, was particularly good - the texture was wonderfully chewy and not too dry. It's far too hard to describe every single cookie, but I'll say this - there was not one that I didn't like, which will clearly make it impossible to get less than say, 20+ the next time I go back. Their service was a little...unapproachable I guess is a good word. But really, if they boxed up those cookies while screaming at me the entire time, I would still give it 5 stars because their product is just that good. I'm almost scared to try the pastries because if they look as good as they taste, and I'm sure they do, there's no going back. Next time you're headed to a dinner party, a friend needs a pick me up, or you just feel the urge to gain a couple of pounds, a box of these cookies is the perfect (and affordable!) solution. bring home cookies and Malvina Cialdi Focaccia. Jealous.